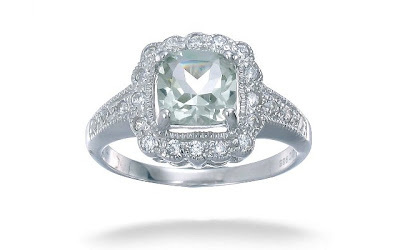 This 7MM Cushion Cut Green Amethyst Ring In Sterling Silver 1.50 CT (Available In Sizes 5 - 9) is currently selling for just $22.99 on Amazon.com!! You will be saving 77% off the listed price of $99.99 with this jewelry deal. What I like about this ring is the beautiful soft color of the green amethyst, something that is not seen very often. I also love the CZ-accented band.